◆ Our 15 drawer rolling storage cart includes 5 bigger drawers and 10 smaller drawers, which provide enough storage space. It is Ideal For Getting Your Work And Life Space Easily In Your Office, Home, School, Garage Or Just About Anywhere Organization Is Needed. 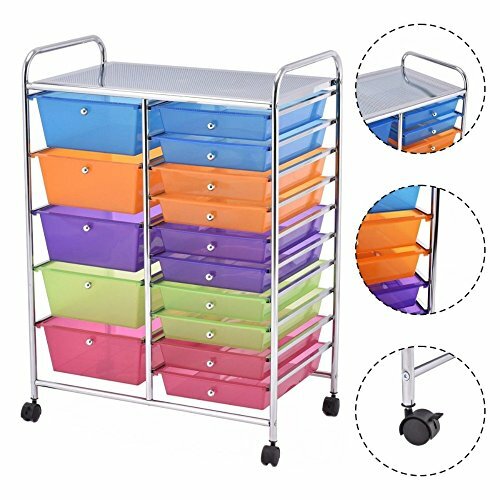 Be made of Chrome Steel Framed and plastic Drawer Organizer, this 15 drawer rolling cart is durable and serve you for a long time. Four universal wheels will help you move it easily. Do not hesitate to buy one! ◆ Specifications Color: as picture show Material: steel frame and plastic boxes Overall size: 24.6"x14.5"x34.2"(LXWXH) Inner Size of big drawer: 13.2"X8.8"X4.5"(LXWXDeep) Inner Size of small drawer: 13.2"X8.8"X2.1"(LXWXDeep) Diameter of wheel: 1.5"
Mainstays Kitchen Island Cart, White. This Stylish Kitchen Furniture Has a Solid Wood Top. Kitchen Island SALE!! Drawer and Cupboard Provide All Your Kitchen Storage Needs. Sturdy Wheels For Moving Around. Towel Bar and Spice Rack.